René Grandjean is born in Bellerive on the 12th of Novembre 1884. Six years later, he follows his family to Paris and starts his first studies before returning to Bellerive where his father builds a mill and a big saw-mill. René spends his childhood working hard for his father. "At sixteen, I understood very well the machinery of the mill and saw-mill. I was able to fix by myself all breakdown. I was passionate about all those mechanism. "1 So pasionate that at age eighteen he decides to leave for Paris to find a job as a mechnanics, he is rapidely hired in a garage but layed off after 2 months for having broken the car of the owner while "playing" with it. The next morning, he is hired as a driver for marquis de Montebello and later in Egypt for the generous sultan Omar Bey who will become his friend. Summer 1909, Grandjean is 24 and dreams since a long time do built a flying machine, the news of Blériot’s flight across the channel on the 25th of July 1909 finishes to decide him, he leaves Egypt and returns to Bellerive to fulfil his dream. 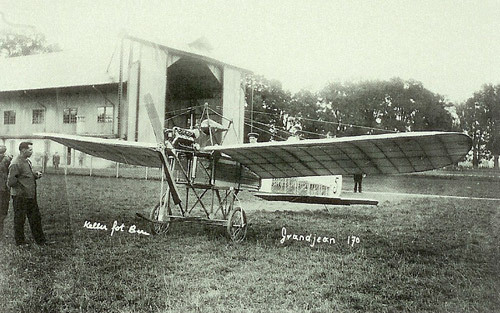 Grandjean will reach his goal, using only a picture of Blériot’s aircraft and thanks to his inventiveness and craftsman qualities, he completes his first flying machine in octobre 1909. 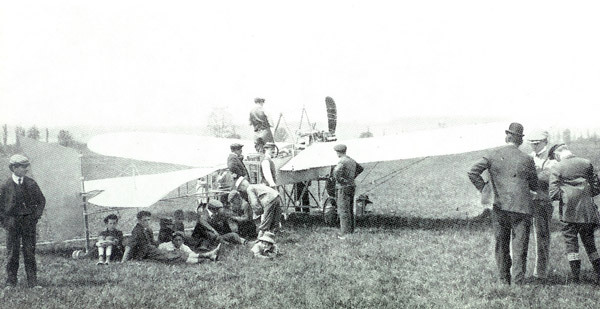 The ground tests starts in february 1910 at l’Estivage ground in Avenches, and, what is recognized today as being the starting point of the Swiss aviation, will happen shortly thereafter. 10 may 1910, ernest Failloubaz is at the controls, he taxies, take speed, take off, fly and land smoothly. That’s the first flight in Switzerland of an aircraft built and flown by Swiss Citizen. Five days later Grandjean will "break wood" while attempting to fly himself. Soon repaired, his aircraft will be again destroyed by Georges Cailler during a meeting in Viry in august 1910. 12 octobre 1910, Avenches prohibit Grandjean from using l’Estivage ground, ending in an obscur way the collaboration between the two friends. All are against him but Grandjean keeps an unshakeble faith, he travels to Dubendorf and find there some ground and welcoming people, he decide to stay. In november he undertakes major transformations on his aircraft and during that winter he learn to fly, by himself. Early 1911 he is hired by Oerlikon to promote their new engine by the big manufacturer Farman, Blériot and Voisin. 18 of jun 1911 he succeed in crossing the Neuchatel lake and three months later, 18 september 1911, he obtains the swiss pilot licence number 21. In december 1911, Grandjean is invited at Davos to fly above the resort, he has the idea to built ski to skid on the snow without sinking into it. He start working and 2nd of february 1912 carry out the first take off and landing on ski in Switzerland. 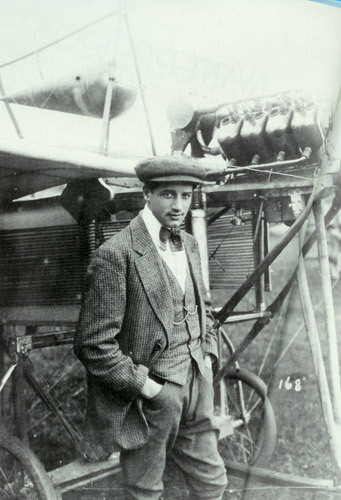 "The invention and absolute success from René grandjean in 1912 had clearly demonstrated, in the course of more than hundred flights in few days without any incident. He was and remains unquestionably the first glacier pilot in the world." Summer 1912, Grandjean replace the skis by floats designed and engineered by himself. The first swiss hydro-plane fly 4th of august 1912 ! At the controls of this hydro-plane he will win several prizes, including the Eynard prize thanks to the invention of a magneto alowing him to start his engine from his pilot seat. Grandjean is called up with his aircraft in 1914 and from now on cannot use his exuberant imagination. He has nevertheless many project, he present them to several friends in Switzerland who remain sceptical. He decide to leave for Paris in 1915 where he rapidely become a very demanded technical counsellor, he will take out a patent for more than two hundred of his own inventions and return definitely in Switzerland in 1956. On 31st of may 1956, he inaugurates his own monument in portalban by the neuchatel lake where he landed after his crossing. Then he participate with almost all surviving pionneer from the heroic period to the 50th anniersary of swiss aviation in november 1960 in Avenches. He passed away 14th of april 1963 at age 78. 10 of may 1965, a monument erected in Avenches in memory of Failloubaz will be complemented by a commemorative plate reminding his collaboration with Grandjean and making it a true monument of the birth of swiss aviation.